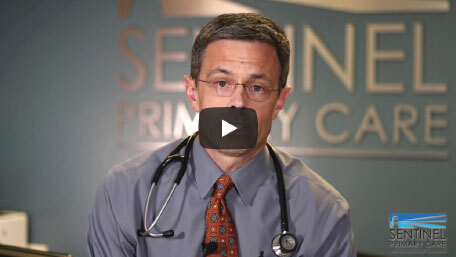 Why the Direct Primary Care Model? 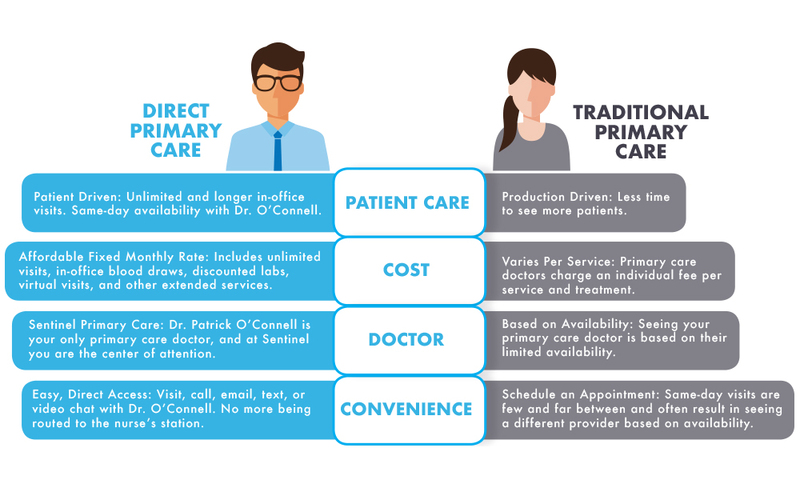 The direct primary care model simplifies primary care and enables Dr. O’Connell to provide individualized and personal medical care affordably for members. Through the direct primary care model members receive top notch primary care for one affordable price. This care includes unlimited office visits and procedures, lab work, virtual visits, and much more. Our patients tend to reduce their healthcare costs significantly because we cut out insurance companies and don’t have the bloated overhead that comes along with most insurance plans. Instead of having your treatment and healthcare services billed through insurance, you’ll pay a monthly fee directly to our office, and this pays for our medical services. Without the need to pay deductibles and other assorted medical bills, our direct primary care model can save you money over time. In some ways, a visit to Sentinel Primary Care is similar to any other primary care visit in Raleigh. However, our relationship-based direct primary care model ensures you are the center of attention at each visit. You’ll be greeted by a cheerful office staff and receive top-notch, comprehensive medical care at each visit because we are passionate about keeping watch over your health. To meet this goal we schedule each appointment in longer blocks to give you quality one-on-one time with Dr. O’Connell. We also offer substantially-discounted labs and can refer for discounted radiology studies. If a complex procedure is required or if you or your family member needs to see a specialist, we are happy to refer you and will continue coordinating your care. “Dr. O’Connell is easy to talk to and he will spend as much time [as needed]. How Much is Covered Under the Membership Fee? Is the Direct Primary Care Model Right for You? Our direct primary care model in Raleigh empowers you to seek treatment when you need it, as opposed to when your insurance company says you can. Whether you have work-funded or private health insurance, are a Medicare recipient or have no insurance at all, you can still become a member of Sentinel Primary Care. Your membership fee can also be paid through a Health Savings Account (HSA) or Flexible Spending Account (FSA). Now that you understand how our direct primary care model works, we’d like to invite you into our office for an initial visit.